Mr Charity International 2018 Dowayne Powell from Jamaica. – United Nations Pageants LLC. Home/Uncategorized/Mr Charity International 2018 Dowayne Powell from Jamaica. 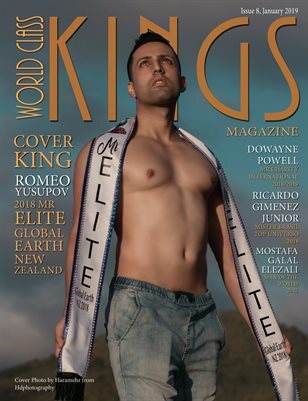 Welcome to prestigious international male print pageant magazine World Class Kings Magazine. Interview with Dowayne Powell Mr Charity International 2018/2019. My platform was Youth Empowerment through Education and it was use as a way to was help young people to believe in themselves that they can achieve success regardless of their origin or background. World Class Kings Magazine would like to welcome amazing King Dowayne Powell Mr Charity International 2018/2019. Hobbies: listening music, watching movies and playing football. Platform: Youth Empowerment through Education . Likes: Food, working out, meeting new people, Comedy films ,volunteering and Charity. Dislikes: persons with no self respect, loud noises ,hate, war and racism. Hello, My name is Dowayne Powell , a 24 year old young man who can be best describe as being humble, respectful and vivacious. I am a young a focus individual who believes that a good education is the only way forward and guided by the philosophy which states ” With God in the midst I can conquer any obstacles that standeth in my way”. This is my first time competing in a pageant. But it was introduce to me via a friend on social media who see what I was about and how badly I wanted to make a impact on young people’s lives . I have always watch pageantry on television but never yet heard of a male pageantry in my country. Volunteering and Charity was something that I always love to be apart of giving back to my community and my country . It was always about queens giving back and promoting a cause but with the United Nations pageant it gives males like myself a chance to identify and showcase my skills, talents and personality best suited to promote a cause and work hard in order to achieve a specific objective and as such I see the United Nations pageant as a system where I could use my platform to continue motivate and inspire young people to be a better version of themselves not to live up to people’s expectations but to exceed the standards that they have set for themselves to continue to make those around them proud . World Class Kings Magazine: Why did you choose to compete for your current title?The reason for competing for my current title is to help young people to believe in themselves that they can achieve success regardless of their origin or background. By competing for the title it would also give me a platform to voice my opinions to young people that they shouldn’t just live up to people’s expectations but to exceeds standards that they have set for themselves to continue to make others around them proud . To aim for something to be a fighter and never give up , to write a book that they themselves can be proud of themselves, that one day someone can say when they grow up they want to be a positive role model. World Class Kings Magazine To those unfamiliar with your pageant system please tell us what is it about? The United Nations Pageant been conceptualized as a prestigious international event, bringing together representatives from a wide range of communities and cultures from all over the Globe; from the world’s most culturally diverse states, the pageant provides delegates with the opportunity to share common values and foster international friendship and understanding. The pageant’s principal objective is to identify and showcase the world’s best tourism cause ambassadors; those who have the skills, talents and personalities best suited to promote their respective countries in the furtherance of tourism, international goodwill and cultural harmony. Apart from a strong emphasis on goodwill tourism protection programs and destinations promotion. The judging was divided into sections. Pageantry Component in which persons are scored based on their sportswear, high fashion, costumes and formal wear; your walk and stage presence. Interview Component which deals with how well you present yourself as an individual and promote your causes and your brand. Charity Component that highlights charity work that is being done by each contestant in promoting the welfare of others. My platform was Youth Empowerment through Education and it was use as a way to was help young people to believe in themselves that they can achieve success regardless of their origin or background. Also not to live up to people’s expectations but to exceeds standards that they have set for themselves to continue to make others around them proud additionally It was also to help the less fortunate and to inspire a life long learning, advance knowledge, and to strengthen my community. World Class Kings Magazine: What appearances have you done with your title? I was able to work with different Charitable organization such as : Davina Bennett Foundation and Shak’s Hope Foundation and several other entities. I have visit numerous high schools across Jamaica some of which includes: Maggotty High , St. Elizabeth Technical , Braes River Primary, Bogue Primary, Robert lightBourne High , Font Hill Primary, Seaforth High School …. Encouraging and Motivating Students. I partnership with Ms Jamaica Goodwill Nicola Thomas , where we did a Children treat and feeding for the homeless in Ochi Rios , I attend public events such as : Posh in Black a fashion show that was put on by a well known model agency called Saint International,I went to Miss UWI Mona pageant, Jamaica National Expo, Cooperate Mingle , EastWood Park New Testament Church. I assisted in the Beautification project of five schools in which no one over the seven years under the United Nations Pageant has ever done also a bathroom renovation project at Robert lightBourne High School as to give the students a more comfortable bathroom facility , I was also featured on a motivational program on YouTube , was privileged enough also to do an interview with a well known magazine name Caribbean Entertainment Magazine, I did feeding of the homeless and a children treat . had the opportunity to help out at a children home called ” The Nest” where we help students. World Class Kings Magazine: What is your on stage strategy to win the judges over? My strategy to win the judges over is to maintain proper eye contact , warm smile , posture and grace , I win them over with my level of confidence, my Genuineness and my personality. World Class Kings Magazine: What makes you stand out from all those other incredible Kings? My leadership qualities, My positive attitude and behavior, the respect I have and a strong : physical, mental and spiritual health, my humility, my passion for success , I keep my word, and I am truthful and genuine, I stand for success and I am relatable. World Class Kings Magazine: Tell us about the moment your name was called out as the winner. I would describe it as my “WOW” moment. Standing there and reflecting on how far I am coming from to where I have reach . I was confident enough because I know that the work in which I have put in during training and how much I have volunteer would be fully paid off. World Class Kings Magazine: What does it mean to you to be a King? To be a king is an amazing accomplishment, it is to be impartial in ones duty and the epitome of a true leader, one who leads through God and by example. Being apart of the pageant has change my life forever : It has allowed me to step outside my comfort zone to be more confident. This has been the most incredible year of my life , filled with countless opportunities that have helped me to grow personally and professionally , it has given me the opportunity to make a difference in people’s lives , especially young people . It also gives me a platform to speak on issues that are meaningful to me. World Class Kings Magazine: You are an inspiration to all the guys out there. How does it feel? It is an rewarding feeling to be a role model to others that they can say when they grow up they want to be just like you . Or the life and what you have accomplished had inspire them to believe in themselves that they can achieve success in life. He would need an expert who can watch him and help him to discover those weird pauses and hesitations, then point him to a method that will help him overcome those hiccups. Whatever the cost of hiring a walking coach the return on investment will be worth it. World Class Kings Magazine: What are your tips for choosing right pageant formal wear? Think outside the box It’s always wise to set a budget for each pageant, and there are various places where you can find beautiful formal wears. Some of the overlooked places are consignment shops. Choose the right color:This will help you determine which season you fall into based on your skin tone. By doing this you know what colors look best on you. Let your outfit be pageant-appropriate Keep the pageant in mind when choosing your formal wear. You never want to go over the top, as this could result in a deduction of points for you. You have to make sure that you are confident in the clothes you wear , your make up just about everything. You have to be genuine and truthful because judges know when you are telling a lie be friendly with your personality and maintain eye contact at all times. World Class Kings Magazine: What is one mistake that you’ve done during competing you wish you could redo and fix it? World Class Kings Magazine: What other mistakes are made by guys during the contest? Not smiling and giving off grace towards judges . Not as yet but hopefully soon. Let’s see what the year brings. World Class Kings Magazine: What are your plans for 2018 as a King? My plan is to continue to motivate and inspire and educate young people to be a better version of themselves and that they can achieve success regardless of their background or origin. I also plan to join different charitable organizations as to help young people to excel in what ever areas they are interested in. Firstly, I want to leave a legacy that a meaningful life is not about being rich , being highly educated or being perfect, but it’s about being real , being human , being strong and being able to give back and touch the lives of others. Secondly,I want to leave a legacy that young people will start to believe in themselves also to be confident, to aim for something positive in life to be a fighter and never give up even when the odds are up against them. Lastly, I want to leave a legacy that young people will be positive role models to their peers, for them to know the importance of hard work and discipline and to be dedicated to achieving a goal. A legacy that they can said when I grow up I want to be just like him. World Class Kings Magazine would like to say thank you to Dowayne Powell Mr Charity International 2018/2019 you for this amazing interview. Sponsors : Enigma, Beautiful Brides & Mr Tux and Western Sports. Print Magazine Dowayne was published in. Print issue 8 purchase link. Platform: Woman Empowerment through World Class Beauty Queens Magazine.